In one week’s time I’ll be headed off for England, and either this blog will go on hiatus or its nature will have to change. I’ve got plenty of adventures planned for my time abroad, quite a few of them even beer related (probably not many pizza related; I don’t know what I’ll do for pizza oh no I’ll probably have to make some!). I’ll be sampling many cask ales in the pubs, taking cycling and train trips to old English breweries, tracking down hop farms on the isle and the continent, and chasing lambics and Trappist brews in Belgium. But for now, tasting notes on my last brew until I’m back. Aroma: Roast malt, bordering on burnt. A recognizable coffee aroma, though not dominant. The beer smells a little green, like a fresh, snapped twig. This aroma has been fading as the beer has aged. The elements of the aroma are well-integrated and don’t clash, even if they are minorly off-putting. Appearance: Dark brown, nearly black. Opaque, possibly hazy but it’s hard to tell with the dark color. The beer is over-carbonated so it forms a massive head even with a gentle pour, but the bubbles become large quickly and the head rapidly collapses. The head is slightly tan in color. Flavor: Comes on sweet and biscuity, settling into roast malt. There is a slightly vegetal flavor in the background, as well as a slight sweetness. Throughout the whole sip there is a firm coffee flavor, though it has a slightly different character than my usual cup of brew. It’s character leans slightly more towards toasty wood than usual, possibly from extracting tannins when sanitizing the beans by steeping them in boiled water for a couple of minutes. Mouthfeel: A little thin and watery. At a recent beer swap at Bitter & Esters I told another homebrewer I had stout envy over his brew’s full-bodied slickness. He said he cheated by using lactose. That direction may be worth investigating in the future, but I’d like to try some other samples first. 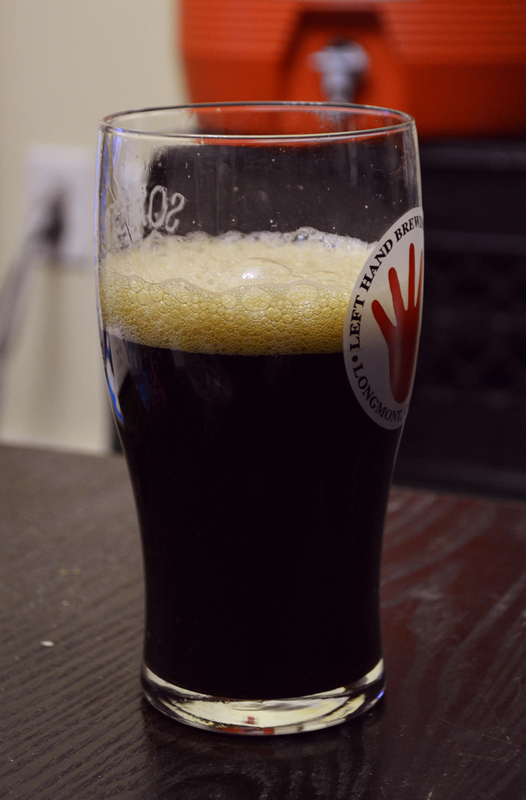 The over-carbonation is a major problem, but it’s easy to fix by swirling the beer and letting it warm up a bit. Quite a few of the bottles have gushed, a problem exacerbated by the fact that some bottles contain fragments of coffee beans which serve as nucleation sites for bubbles of CO2. Overall: This brew is pretty decent – not my favorite but not a chore to drink. I’ve certainly paid money for worse. While it give some hope I could brew a mean coffee stout in the future, I think the weakness of this beer essentially stems from base beer faults. While I think my handling of the coffee wasn’t ideal either, I think the carbonation and thinness of the beer are the major problem. It’s also possible that the vegetal flavors (along with the over-carbonation) are due to poor yeast health or infection, although I have some suspicion it comes from the coffee. I’ve been trying for some pretty bold and ambitious brews lately, but it may be worth taking the time and effort to brew some superb examples of basic styles. Hopefully the next six months in England will inspire me to do exactly that. This entry was posted in beer, tasting and tagged carbonation, coffee, fermentation, porter, stout, yeast on January 22, 2014 by Dylan Bargteil.